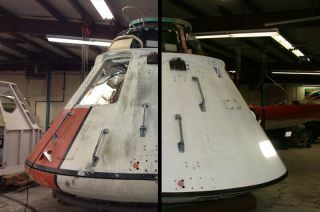 Before and after — Apollo test capsule Boilerplate 19A as it appeared before it was restored (left) and after eight weeks of preservation work at the Kansas Cosmosphere and Space Center in Hutchinson, KS. A dummy capsule that NASA used in the lead up to the Apollo moon landings has been restored to its former glory to inspire a new generation of space explorers at a California learning center. The red-and-white painted capsule, known as "Boilerplate 19A" (BP-19A), was built in the early 1960s by the same aerospace company and to the same basic design specifications as the space-worthy command modules that flew crews to the moon and back. But, instead of lifting off, BP-19A was dropped out of the back of a cargo plane to test the recovery systems that would safely land astronauts back on Earth. More than four decades after its final test flight, and years after being displayed outdoors in a county park, BP-19A was entrusted to SpaceWorks, the exhibition design and artifact preservation division of the Kansas Cosmosphere and Space Center in Hutchinson, KS, for its restoration. "Compared to other remaining capsules from the Apollo era, this particular artifact was exceptional, due the fact that it still contained original components," said Richard Hollowell, the Cosmosphere's interim president and CEO. "SpaceWorks stabilized the original materials, cleaned and preserved the surfaces and prepared the capsule for full-time exhibition." North American Aviation built BP-19A in 1963, when the 12,000-pound (5,400-kilogram) spacecraft entered service for NASA. Starting in 1964, BP-19 was dropped multiple times from a C-133 "Cargomaster" military transport aircraft flying over El Centro Naval Station, Calif., deploying drogue and main recovery parachutes to slow its descent to the ground. Four years later, after the parachute designs were proven, the capsule was modified to test VHF recovery antenna systems, gaining the "A" in its BP-19A designation. By employing an unmanned boilerplate, NASA was able to evaluate the Apollo spacecraft's recovery systems without endangering astronauts' lives. In April 1972, as the second-to-last moon landing mission got underway, NASA transferred ownership of BP-19A to the Smithsonian Institution in Washington, D.C. for public display. For decades, the test capsule sat inside a glass enclosure under an outdoor gazebo at a park in Lancaster, Calif., alongside three lakes that were named for the first crew to land on the moon: Armstrong, Aldrin and Collins. In April 2007, the Smithsonian's National Air and Space Museum decided to return BP-19A to the site where it was built. The capsule, the second of two Apollo boilerplates assigned to the Columbia Memorial Science Center for exhibit, first arrived at the Downey educational facility in 2008 and was placed on temporary display there last year. SpaceWorks restoration technician Don Aich returns the exterior finish of Apollo test capsule BP-19A to its original state. BP-19A's restorationtook SpaceWorks about eight weeks to complete, adhering to the techniques approved by the National Air and Space Museum. It was the first major artifact project completed by the Kansas Cosmosphere in recent years. "Museums worldwide have been affected by the economy, so new exhibits and restoration have been primarily on hold for the last several years," Hollowell said. "We are starting to see signs of economic recovery, and museums are now eager to get back on track with their exhibitions and collections." "The bids we currently have pending represent more than half of SpaceWorks' annual budget, and we expect to see more bid opportunities yet this year," he said. Chief among the new bids is an opportunity to produce the display case for Freedom 7, the Mercury spacecraft Alan Shepard rode to become the first American in space more than 50 years ago. The historic capsule is being relocated from the U.S. Naval Academy in Annapolis, Md., to the John F. Kennedy Presidential Museum in Boston. The Smithsonian-affiliated Kansas Cosmosphere houses the largest collection of space exploration artifacts outside the National Air and Space Museum in Washington, D.C. It also houses the largest collection of Soviet and Russian space artifacts outside of Moscow. Prior to BP-19A, the Cosmosphere's SpaceWorks division worked to restore several flown U.S. spacecraft, including the Apollo 13 command module "Odyssey," the Gemini 6 and Gemini 10 spacecraft and the "Liberty Bell 7" Mercury capsule that in 1999 was recovered from the ocean floor. The Columbia Memorial Space Center, which opened to the public in 2008, honors space shuttle Columbia's final crew, who were lost on Feb. 1, 2003 when the spacecraft broke apart during re-entry at the end of their mission. In addition to exhibiting artifacts like BP-19A, the center includes a Challenger Learning Center that takes students on simulated space missions into Earth orbit, to the moon, Mars and beyond.